(4) Water everywhere but where did it come from? 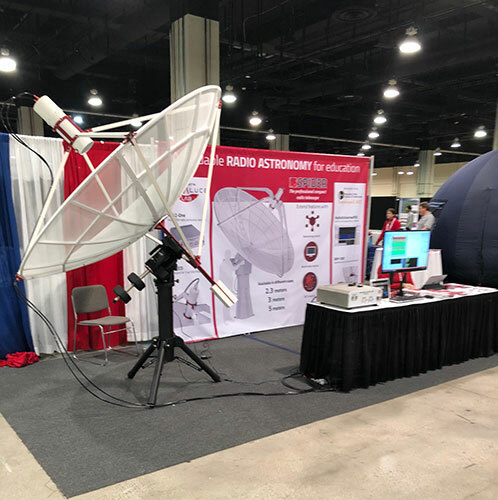 One of the things I am still interested in is whether or not amateurs can participate in making radio astronomical observations? Well, we have seen many instances of this and the premier radio telescope for amateurs is something like the Primalucelab Spider system as seen below. I don't know about you, but I just do not have enough physical room and space for something like this, but I do like the concept. This setup is optimized for operation at 1420 MHz, which is the neutral hydrogen quantum mechanical spin flip frequency and can be used to trace the outline of neutral hydrogen in the universe, which can be correlated with the structure of the universe.. Many radio frequencies are of interest in astronomical observations. Recall that the Cosmic Microwave Background (CMB) is used to establish the current temperature of the radiation released just 300,000 years after the big bang. The radiation at that time was that of blackbody thermal radiation left over as the big bang was still cooling off and was of much higher in frequency, which has now been stretched by the expansion of the universe. That epoch of recombination when the radiation could begin to freely stream throughout the universe was at a redshift of about z = 1100. Today's measured temperature of 3 K at redshift z = 0, was generated when the early universe would have been a hot ball of gas at a thermal temperature of about 3 * 1100 = 3300 F. Much can be learned by examining the spatial distribution of the this temperature today, including the amount of dark matter, dark energy and Hubble constant. Another aspect of the history of the universe that can be traced by radio astronomy originates during the epoch of reionization. Remember that this is the time after the epoch of recombination that the CMB was released, up to the time when the first stars turn on and begin to reionize the neutral hydrogen gas. Up until that time, the universe was in the dark ages since nothing was shinning. 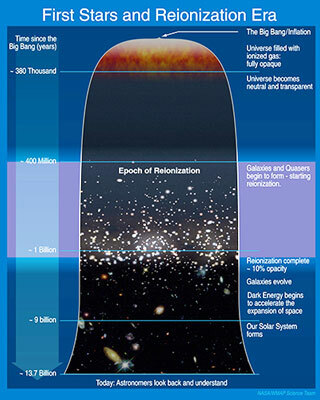 The epoch of reionization is considered to have happened around redshift of z = 6 through z = 20. As the universe expanded from z =20 down through history to z = 6, the 1420 MHz signal released at that time would have been stretched to much lower frequency by a factor of 1 / (1 + z), so the original signal would show up here now in the 60 - 200 MHz frequency range, depending on the actual redshift at the time. So making astronomical observations over this frequency range can probe back in time, corresponding to red shifts from about 6 to 20. In the chart below you can see that this time period corresponds to the early universe from somewhere between 400 million years and 1 billion years after the big bang. So that makes this frequency range the real history channel! Unfortunately, the Spider system has been optimized for operation at 1420 MHz and might not work too well at 60 - 200 MHz. For the next topic, Darby Dyar, Planetary Scientist at Mount Holyoke College shared her vision and passion about Venus and that we should go back to Venus because Venus is our sister planet and the key to understanding how planets form and what happens to them as they evolve. She said that we have not visited Venus since the Magellan mission in 1990-1994 timeframe and that most "known" facts about Venus are really just myths. 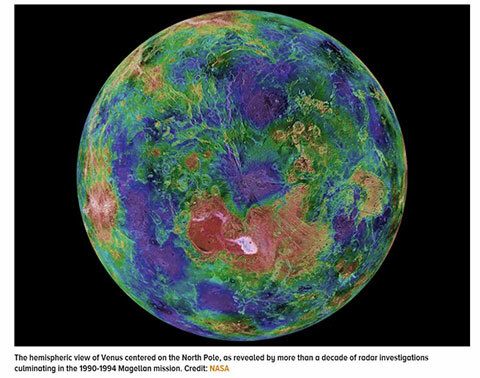 She said we can get better elevation data through the clouds and that Venus is not dead and does have hot spot volcanism and more water and is not as dry as commonly believed. Many planned missions to Venus have got pretty high up in the review process only to get scrubbed for other higher priority missions. Next, Professor Ferguson, University of Edinbourgh, explained how history of how galaxies form and evolve is contained, and until recently, hidden, in the low surface brightness objects in the peripheries of the galaxies. This fossil record can be uncovered by tracing the paths of dim dwarf galaxies and stellar streams that show how galaxy interaction shreds some galaxies and enhances others as they evolve in their mutually gravitationally bound cluster of galaxies. 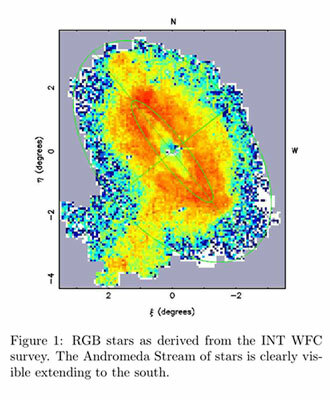 For instance in the photo below, similar to ones she showed in her presentation, you can see (well, the author says it is clearly visible) a stream of stars left over from some previous encounter among the galaxies that make up the Andromeda system. She said it takes a lot of work to find and identify these very dim dwarfs and collections and streams of stars associated with past encounters. A key requirement for the telescopes used in doing this is the ability to see very deep, with long exposures, but also wide field of view because the stellar streams are not easy to identify without seeing the larger structures. As an example she said to see these structures in Andromeda (M31) you need to have a field of view of about 30 degrees, which covers a distance of about 300 kpc. Most planetarium software tools list Andromeda of being only about 4-5 degrees across. The technical session on water in the universe and where it comes from and how it is found in any particular solar system was also a very interesting session. First up was Joan Nagita, NOAO, who talked about the role of water in the accretion of dust grains into larger objects in the early protoplanetary disks around new stars. It turns out that water gloms onto the dust particles and this affects the "aerodynamic" drag on the particles and determines how far they migrate towards the new star. Water and organic compounds, formed or collected on the dust grains, and everything migrated in the protoplanetary disks. Radio observations, from ALMA and other observatories, using the 183 GHz water line, can identify where the water is located in the disks. 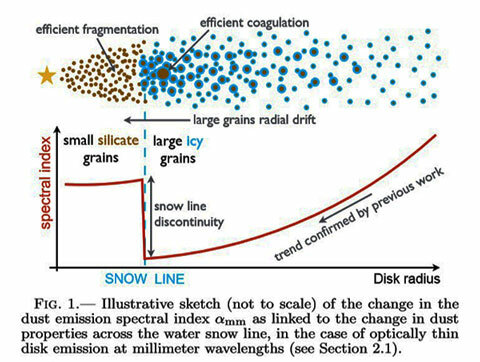 The illustration below shows how the snow line is an easily identifiable location in the disk. Harold Linnartz, Leiden Observatory, Netherlands, described some of the ongoing laboratory efforts to characterize how water behaves in the cold, vacuum conditions found in protoplanetary disks. These laboratory studies confirm and identify the spectra that should be found in observations. Water and CO are often found together and in under ultraviolet conditions various organic compounds can be formed along with the dust grains. The water, available as ice typically, can help shield these molecules from disintegration and also help form more complex molecules in some cases. 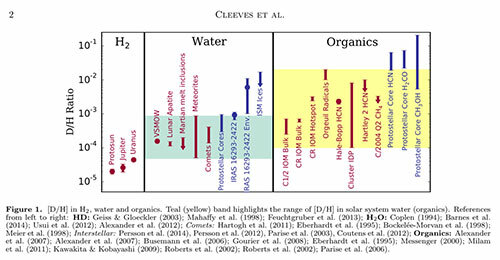 Measuring the fraction of heavy isotopes of water also helps identify where the water came from and what types of chemical fractionation processes have occurred. Recall that measurements of he Deuterium / Hydrogen ratio on comet 67P indicated that the water from comets is not where the water on Earth came from. Admittedly, this is only one water sample, but the evidence is pilling up that the water on Earth was here all along during its pre-history. Also Edwin Bergin, U of Michiagan, was another presenter in this water session and he described how we can follow the trail of the water by using isotope ratio measurement and we can follow the trail of water through the history of these measurements. The amount of deuterium is like a fingerprint and tells us where the trail of water goes. made a very interesting and informative presentation on some of the electromagnetic counterparts observed after the GW170817 neutron star merger. He discussed how the arrival time here on Earth, even hundreds of days after the merger, leads to contradictions and evolution of new models to explain the processes involved in generating those signals. 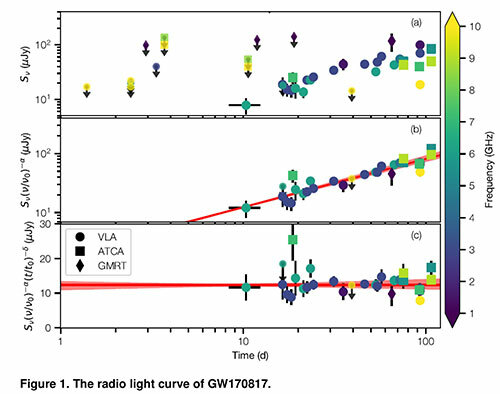 The slide below, from a paper by Mooley, et al, shows how the radio signature, as observed by three different observatories, shows received amplitude variation over days. He also described how the early arrival of gamma rays was received about 1.7 seconds after the merger, but that the received amplitude was about 10,000 times weaker than many other gamma ray bursts (GRB), so the source of the GRBs is still not explained by this first example of merging neutron stars. More observations from future LIGO detections are needed. The best leading explanation for the light curves and small gamma ray amplitude is called the "cocoon" theory and is illustrated in the cartoon below. The best explanation has to account for the small amplitude of received gamma rays, the late arrival of radio and x-ray signals and the color of received optical light also. Each of these signals is generated by different processes that occur during and after the merger event. There is a lot of physics in all of this and I can see that my homework load just increased. The theoretical understanding of the physics of the merger is still being developed and the emerging capability of computer simulation models that can cover all of the detailed physics over the space dimensions necessary is still a very difficult field, although a lot of progress is being made. The presentation by Robert Fisher, U of Mass., showed some of the complexity in understanding how to model exploding white dwarfs and other merger events. One of the problems is the large dynamic scale in space over which the modeling simulation must extend, something like 15 orders of magnitude. Why so large? Well the simulation must start on the very small scale where the nuclear reactions and that first location where the density is so great that gravity can overcome the other forces and the reactions that start there must then propagate to other regions. As the nuclear reactions and energy released from gravitational collapse proceed, a lot of material is accelerated to up towards the speed of light. Now if your simulation of interesting behavior needs to go on for several seconds, this material is going to cover large multi lightseconds of distance and the computer code has to still track all of the physics. 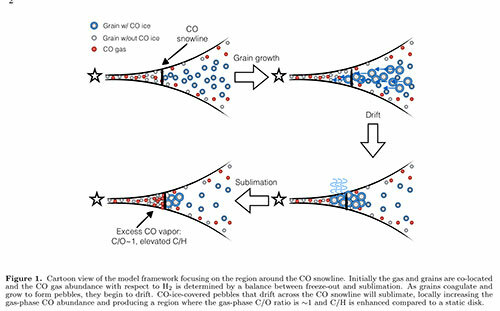 Fisher showed the results of many simulations and the first thing that becomes apparent is that these explosions are not going to go on symmetrically, the cocoon generation being one of these effects. We also know from general relativity that if the explosion were completely spherically symmetric, there would be no production of gravitational waves. So, we see here that the explosion here, and for the case of a binary merging pair, the event is not going to be symmetric and therefore will result in the production of gravitational waves. 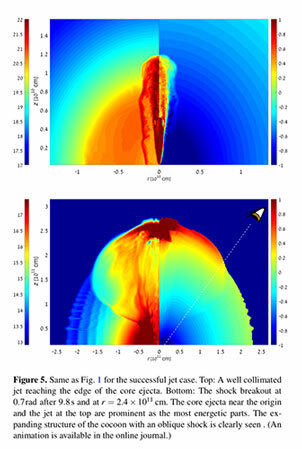 I couldn't find the references to the actual simulations which are very interesting to watch, but I did find a computer generated image, which shows an instance of a cocoon being generated. Now, I have to say, I still don't understand all of this plot, but it does show the beautiful and intricate way in which the explosion evolves. 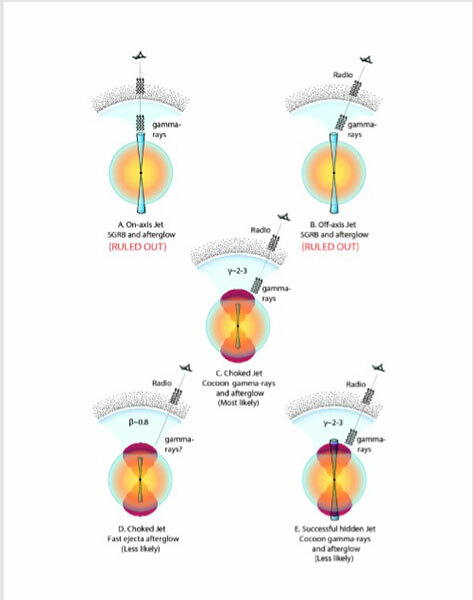 I tried to read this paper on the airplane coming back to California from DC, and even with the help of a glass of wine, I still couldn't quite understand it. It has something to do with the three different times scales needed in the simulation to account for the widely spaced events occurring in the explosion, or something like that. You can always dig deeper into this for yourselves by following the indicated references. Ok, that is my little summary of these five great topics. There was so much happening at the AAS 231st meeting that it was hard to follow more than a few interesting tracks and sessions. Remember that the AAS has a special very low meeting fee for amateur astronomers, so take advantage of that when you can. I also found that I had to spend very strict attention to try to understand and capture what each presentation was all about and I missed probably as many things as I captured. They represent a lot of interesting physics and for this physicist wannabe, a lot more homework and study. I also escaped with only buying 3-4 books this time, which was pretty amazing given that a half dozen publishers had booths in the exhibit hall!